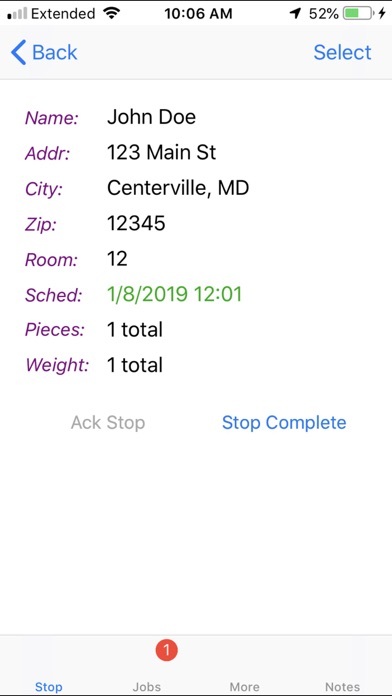 ecMobile allows users to connect to, and receive dispatches from, many of the nation’s leading courier, delivery, and logistics companies. If you have a truck, car, van, pickup, bike, or even a pair of shoes, you may be a candidate to perform pickup and delivery services in any city in the U.S. Once you have registered with a delivery company, you can receive dispatches right to your device, and provide real time status updates, including bar code scanning data and signature images, back to the delivery company. By simply logging on, you can signal to the delivery company your current location and that you are ready to receive work requests. Please note that this app uses GPS running in the background, which can dramatically decrease battery life. Error all the time. Doesn’t go trough sometimes it’s freezing all the time. Not happy with it. It’s not working as a $10 app. It should be free. updated review-999ing stops time consuming. Allow mileage entry at opening of manifest. Paid $10 for app as an iphone user. But iphone users seem to not be able to enter starting miles when opening a new manifest or job. Please fix this. Seems an easy fix. The program DOES allow for ending mileage at close of manifest. That seems fine. This is a pretty big issue. Thanks. Otherwise good software. Thank you. What kind of craptasticness is this? When I’m working I can’t be checking my app every 2 min to see if my dispatch has sent more work through, I’m driving and trying not to crash and get people their stuff on time. Cause they pay for it like that ya know!? Dispatch is super busy as well so they can’t call me constantly to let me know either. This seems like such and easy fix! Come on and get it together ppl! When will we be able to have a tab for the history of jobs done or received!?!?! I pick up and drop off every day with different number of pieces each day and drop off with different weights every day. I now have to tie up a dispatcher two times a day calling to change pieces and weights. Please fix this.